Article from the SF Chronicle is tracking the conversation about E-Scooter expansion in San Francisco. Scoot and Skip have been operating there for the last year after a contentious start to scooterdom in the city. A number of companies flooded the market, prompting the City to ban them altogether until they developed a plan for pilot deployment. That went well and now they are thinking of going from at total of 1250 scooters to 2500 scooters. Locking! The entire SF fleet has locking mechanisms that seem to have 1. reduced overall number of complaints about scooters misparked on sidewalks and 2. have limited the number of scooter thefts. Some problems to keep working on: demographic using the scooters is still largely white, male and wealthy. Come to the Urbanism Next Conference to learn how cities throughout the country are shaping micromobility in their communities! Early bird registration rates for the National Urbanism Next Conference are only available through the end of the day Friday! We are very excited about the conference program, and we have a great lineup of speakers, sessions, and workshops covering everything from how to harness shared mobility data and curb management to the opportunities and challenges of urban delivery and senior housing in the age of the sharing economy. Check out our website for complete details. This year we will also be hosting a lightning talks event on Tuesday, May 7! We hope you will join us in Portland May 7-9! London’s new Ultra Low Emissions Zone (ULEZ) charge was instated this week, adding a £12.50 ($16.40) charge on top of the regular £11.50 ($15.10) congestion charge for driving in the heart of London. The added ULEZ charge applies to gas-powered vehicles older than 2006 as well as diesel-powered vehicles older than 2015. Want to drive a diesel or gas-powered private bus into the ULEZ? That’ll be an additional fee of £100, or roughly $131, per trip please. London’s polluted air affects two million residents and the amount of pollution-related deaths is startling. Limiting older, more polluting vehicles is an important step in addressing these preventable deaths and illnesses. While the ULEZ is now operational in the Central London core, London plans to expand the ULEZ to a much broader and more residential area in 2021. Since lower income people tend to live in areas more exposed to pollutants in disproportionate numbers, expanding the ULEZ to include London’s inner ring suburbs will help extend the benefits of cleaner air to these groups. However, lower income people also tend to be more car-dependent, especially those who work in the central city area but have been pushed to seek more affordable housing further from their jobs. And lower income people are also more likely to drive vehicles that would subject them to the ULEZ fees in their own neighborhoods when the area is expanded. 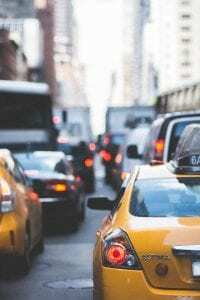 The potential for financial impacts to lower income people also came into play in New York City’s congestion pricing debates as well. However, as Laura Bliss from CityLab reports, a prominent NYC anti-poverty advocacy group found that the vast majority of lower income people that commute to Manhattan use transit, and thus would benefit from the transit system improvements that congestion pricing would fund. 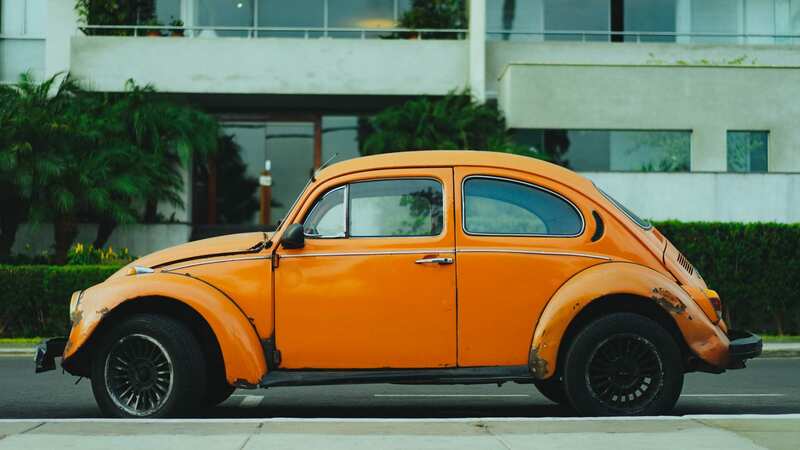 Additional financial mitigation measures are being considered for affected lower income people in NYC, and in London there are plans to provide lower-income people with funding to replace their cars with newer ones that would be exempt from the ULEZ charges. The idea that congestion charges are inequitable does deserve careful consideration as it is important that the needs and experiences of all road users are accounted for. But in order to compare the fairness of congestion pricing to the current system without such pricing, we must think more broadly about what fairness entails. As Michael Manville outlines, “the benefits of free roads accrue disproportionately to wealthy people.” Only the lower income people who can afford to buy, fuel, insure, and maintain the vehicles needed to drive on ‘free’ roads benefit from this amenity. Conversely, many more lower income people cannot afford driving at all, making strategic and systemic investment in transit all the more critical. Congestion pricing with well-planned revenue allocations can indeed help benefit lower income populations with better transit services and cleaner air in the neighborhoods that are closest to major streets and highways. One of the Shared Mobility Principles for Livable Cities, which was initiated by Robin Chase and has now been signed by a broad coalition of nonprofit entities, private companies, and municipalities, is to “support fair user fees across all modes” While transportation network companies (TNCs) have been the target of some fee programs, including in NYC, the above Shared Mobility Principle reminds us that it’s important to think comprehensively about the transportation system and congestion. True, there is evidence to suggest that TNCs are contributing to congestion, but congestion existed long before TNCs did TNCs are also being used in ways that benefit lower income people with limited transit access or special needs, like Columbus, Ohio’s prenatal care TNC transportation pilot. Congestion pricing, therefore, needs to be applied not in ways that focus on a single mode, but in ways that seek to make the entirety of the transportation system better and more fair for all users. Early bird registration rates for the Urbanism Next Conference now available through Friday, April 12! How can we harness technological innovations to achieve the outcomes we want to see? We’ll be discussing that in depth at the upcoming National Urbanism Next Conference in Portland, OR May 7-9. We hope you’ll join us! Early bird registration is now available through Friday, April 12! We are thrilled to be bringing together architects, planners, landscape architects, developers, academics, and many others for conference. Experts from around the country (and the world!) will discuss what new mobility, AVs, and e-commerce mean for equity, health, the environment, the economy, and governance. Check out our website to get information about plenary speakers, as well as details about all the sessions and workshops that will be presented! Those are the words that Donald Shoup used to describe the curb during a session at the LA CoMotion Conference a few months ago. And he is right. For years, curb space has primarily been allocated to the storage of private vehicles through the provision of short- and long-term on-street parking. While there have always been competing demands placed on this limited space, it has never has been as in demand as it is today. There are all kinds of reasons for the heightened demand—the introduction of transportation network companies like Uber and Lyft, the growth in dockless shared mobility devices like electric scooters, the continued growth of e-commerce, and the ease of in-app ordering combined with low-cost delivery, often provided by courier services like Grubhub and Doordash. All those drivers, couriers, riders, mobility service providers, etc. are in need of curb space, so perhaps it’s no wonder that this previously overlooked bit of real estate is becoming hotly contested. Needless to say, there is lots to discuss about management of the curb and we recently explored some of those questions in our new report about New Mobility in the Right-of-Way. But there is still much more to discuss about the curb AND about data—data privacy, data gathering, data sharing—and we’re excited to have an opportunity do so at the Urbanism Next Conference. We’ve got two sessions devoted to the curb: “Bringing the Curb Back: How Cities Are Innovating in 20ft” and “‘I’m All for Progress, It’s Change I Don’t Like’: Pushing Past the Bias to Keep the Curb the Way It Is.” And as for data, we’ll have folks from the aforementioned Populous and Remix (among others), exploring the topic in “Harnessing Shared Mobility Data to Help Cities Redesign Streets of the Future” and “Data Is a Girl’s (and City’s) Best Friend.” If you’re interested in these topics, we hope you’ll consider joining us for these discussions…as well as many others about how we can harness emerging technologies to create the outcomes we want to see. Early bird registration deadline for the Urbanism Next Conference is coming up! We are coming up fast on the early bird registration deadline! Be sure to register by April 2 to get the early bird rate and to secure your spot in the workshop of your choice before they fill up. This year, we are also offering a full-day workshop for elected officials and government leaders in addition to a series of engaging and interactive half-day workshops! Check out the schedule page for full workshop descriptions. We are also excited to be hosting a lightning talks event in conjunction with the conference on Tuesday, May 7 in partnership with the Portland Chapter of Young Professionals in Transportation (YPT)! We are accepting submissions for lightning talk proposals through April 2, and speakers at any level of professional experience are welcome to apply. Visit the Urbanism Next website for schedule details, registration information, sponsorship and exhibitor opportunities, accommodations, and more. We hope to see you in Portland in May! CityLab recently reported on Berlin’s Frauenticket promotion, which offered discounted transit tickets specifically for women. It’s not a coincidence that this one-day promotion happened 77 days into the calendar year on March 18th. This is the same number of extra days that a German woman would need to work to take home the same annual earnings as a German man. The Frauenticket price reduction of 21% is also equivalent to the average reduction in pay that German women receive for comparable work by their male counterparts. While the Frauenticket promotion only lasted one day, it raises the important point of gender-based inequities in transit access and travel experiences. On top of earning less to begin with, women and female-presenting people face threats to their safety—both real and perceived—when taking transit that translate to additional transportation costs that men don’t incur. 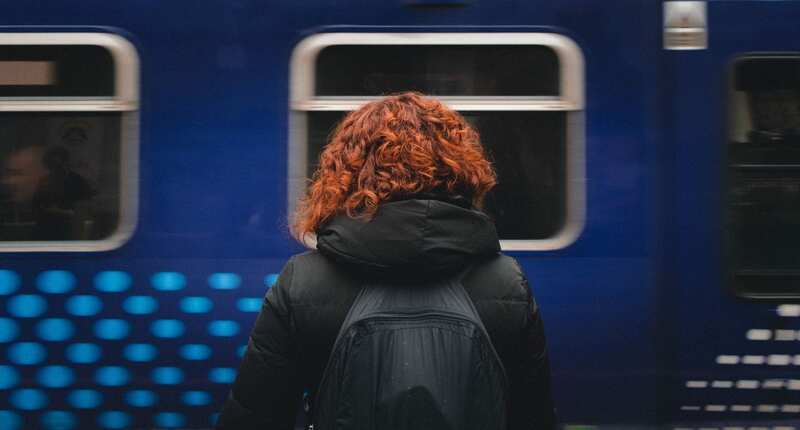 Researchers at NYU’s Rudin Center for Transportation recently published a report called The Pink Tax on Transportation that highlights the additional costs women pay for accessing safe transportation. Of the women surveyed for the report, 42% felt that for-hire vehicles were the safest choice for late night travel. This translates to an additional monthly cost of $26-$50 for women seeking safer forms of travel whereas men pay $0 for the same reason. Women who are also caregivers for children or the elderly can spend double that in order to ensure safe transportation options for the people they are responsible for as well. But paying these extra costs is only an option for those who can afford them, making women of lower incomes even more vulnerable when using transit. Especially as we begin to introduce new forms of mobility into our transportation networks, ensuring that these modes are serving existing needs and goals will be key to making sure these innovations help us work towards transportation equity for all. New reports, new podcasts, and the Urbanism Next Conference! 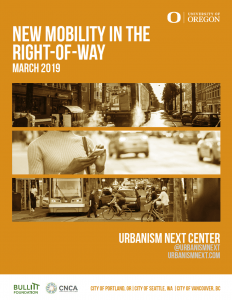 Urbanism Next is pleased to share a new report: New Mobility in the Right-of-Way (Howell, Larco, Lewis, and Steckler), which explores the ways in which demand for the right-of-way, broadly, but the curb, more specifically, is changing. The curb has long been in high demand with multiple users vying for limited space, especially for the purposes of parking personal vehicles. However, TNCs and other services have helped to usher in a new age that involves an increased demand for short-term loading and micromobility device parking. AVs will likely exacerbate existing issues with the right-of-way and the curb, which is why it is important that cities tackle curb management in new ways. 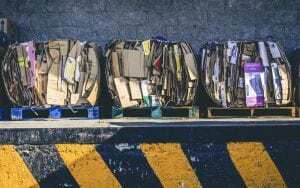 This report categorizes and summarizes efforts that are already underway in cities across the world to rethink curb management and identifies major research gaps. 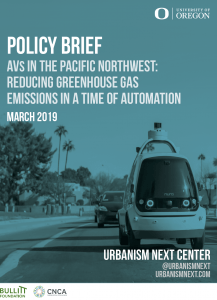 We are also pleased to share the accompanying Policy Brief: AVs in the Pacific Northwest that summarizes the key takeaways from both phases of research related to this project. 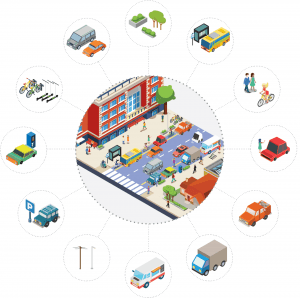 This policy brief outlines our main findings and includes a series of process/procedural and policy recommendations for cities to consider as they adopt new mobility plans and enable automated vehicles. Urbanism Next Program Director Becky Steckler was featured on the NACS Convenience Matters podcast this week. Convenience Matters is hosted by NACS and the Fuels Institute. You can check out the full podcast here. Becky also gave a presentation at TEDx McMinnville in January and the video is now up! We are in high gear preparing for the Urbanism Next Conference, and we hope you’ll be able to join us in May! Check out the schedule page for details about the sessions and workshops that will be offered and stay tuned for an announcement about our plenary speakers next week! Early registration ends April 2! Submit a Proposal to Present a Lightning Talk at the 2019 Urbanism Next Conference! Registration is underway for the 2019 National Urbanism Next Conference and we already have a great mix of people representing a variety of professions from across the nation and globe who will be joining us May 7th-9th! One of the many highlights for last year’s conference attendees was our Lightning Talks event where a dozen established and emerging professionals talked about how technology will shape the built environment. These fast and fun presentations typically consist of 20 slides which are only up for 20 seconds each, however we’ll be doing 20 slides for 19 seconds each in honor of the year 2019! We are currently seeking presenters for this year’s Lightning Talks, which will be held Tuesday, May 7th from 5:30-8pm in Portland. Our topic is How do we harness emerging technologies to reach desired outcomes? Your presentation can explore any aspect of this question that you want, although we suggest using the Urbanism Next Framework as a guide for the types of outcomes to consider. We also encourage presenters to get creative and embrace the fast-paced nature of these talks. 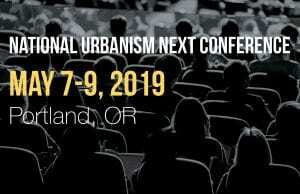 Register Now for the National Urbanism Next Conference 2019! Join us for the National Urbanism Next Conference 2019! Last year, we discussed how technology is changing cities. This year, we will focus on the ways that technological innovations can be harnessed to achieve desired outcomes. Experts from the public, private, and academic sectors will come together to discuss recent innovations, research findings, pilot projects, collaborative efforts between the public and private sectors, and much more! Early registration ends April 2! Register now to save! With the volume of deliveries increasing, the pressure is on carriers to deliver packages in as efficient and timely a manner as possible. However, that can be really tough to do, especially in dense areas: “According to Anne Goodchild, director of UW’s Supply Chain Transportation and Logistics Center in Seattle, research shows about 80–90% of delivery drivers’ time in urban areas is spent on foot, searching for the right apartment or office, riding up and down elevators and haggling at reception desks where employees don’t want to be responsible for the flood of boxes. And all the while, their trucks are blocking lanes and slowing traffic.” The Urban Freight Lab, part of the Supply Chain Transportation and Logistics Center, refers to this as the “final 50 feet” of urban delivery and is exploring different ways to manage these hurdles by experimenting with common carrier locker systems and other solutions. But there are some big picture questions about the impacts of e-commerce that require more examination—like what are the net impacts on the number of trips and vehicle miles traveled of online ordering? And what role does land use play in managing the cumulative impacts of more freight overall? We’ll be digging into these questions at the upcoming Urbanism Next Conference May 7-9 in Portland. (Full session and workshop details will be available on our website next week and registration will be open soon.) If you’re interested in these issues we certainly hope you’ll join us! Coming Soon to Oregon: Statewide TNC Regulations? It’s understandable why companies like Lyft are interested in seeing statewide regulations enacted—if every jurisdiction has its own regulatory framework that companies have to comply with it makes scaling operations more difficult. And statewide regulations, as a whole, are not necessarily bad. However, statewide regulations that preempt local authorities can effectively eliminate important leverage points at the local level, and that can be problematic. What if state legislators took Portland’s regulatory language and codified them into law, taking Lyft’s interest in a statewide regulatory framework and applying Portland’s standards to TNCs to every city in Oregon? Those could serve as the minimum standards and cities could retain abilities to add to them based on local context. Theoretically, both could be satisfied by this—Lyft with a uniform framework and Portland for retaining control, along with seeing similar standards applied elsewhere. The Oregon representative sponsoring the bill suggests that minimum standards are what she’s really after—she is quoted as saying that she’s just interested in seeing a “floor” created without necessarily putting limitations on what local jurisdictions can do. But what the floor looks like will remain a mystery until the bill is officially introduced. For their part, Lyft’s spokeperson “‘said the company is ‘committed to working collaboratively with policymakers and regulators. '” It will be interesting to see how this all plays out. Stay tuned, folks. 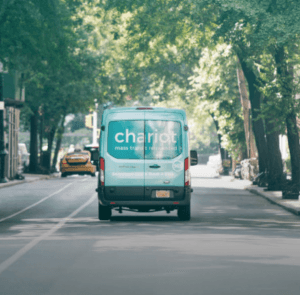 Microtransit provider Chariot announced it is ceasing operations by February 1. The company, which launched in 2014 as an on-demand shuttle service, was acquired by Ford two years ago as part of Ford’s effort at rebranding itself. (The automaker launched Ford Smart Mobility in 2016 as a subsidiary of Ford Motor Co. to focus on emerging technologies.) Prior to the announcement, Chariot was operating in Austin, San Francisco, and New York, among others, including Denver, where service launched in October as part of a city-led pilot program. The pilot was supposed to run through April with the city reportedly paying Chariot $250k to operate service, but the city is now faced with the dilemma of what to do for the service’s regular riders given the premature ending. But, that hasn’t stopped the death knell for Chariot. So, what is the future of microtransit? What role does microtransit have to play and can it be viable? This is definitely a topic we’ll delving into at the 2019 Urbanism Next Conference. Details on the full conference program will be available soon, but in the meantime check out our website for a schedule of events, as well as pricing and travel info. We hope you’ll join us. As one might expect, we are just a few weeks into the new year and e-scooters are making headlines again. On Tuesday Portland’s Bureau of Transportation released a report detailing its findings from the city’s four-month e-scooter pilot last year. Spoiler alert: officials are recommending that the e-scooters return to streets this spring. (All scooters were required to be off Portland’s streets by the end of the pilot in November, despite pleas from companies to keep them in operation.) Ultimately, it seems that the agency has decided that e-scooters hold enough promise in helping the city work towards its key policy goals that it is worth inviting them back, despite some shortcomings outlined in the report. In addition the report makes an important point about how we evaluate the potential CO2 emissions savings of e-scooters—getting people to switch from a personal vehicle to an e-scooter is just one part of the equation. The companies’ business models is the other part. How many cars are on the road solely for the purpose of deploying, balancing, fixing, and rounding up e-scooters for regular charging? Are there enough people switching from a personal vehicle to an e-scooter to tip the balance in the right direction and create a net reduction in total vehicle trips? At this point, that question remains unanswered, but we’ll see what 2019 holds for the scooter-verse. Happy 2019, all! We’re officially a week into the new year, and we hope it’s off to a great start for you. Before we get too much further into 2019 we wanted to take a moment to reflect on the year that just ended, as well as consider the year ahead. Urbanism Next grew considerably in 2018, and we’re looking forward to continuing that growth in 2019 (and beyond!). For one thing, we held the 1st Annual Urbanism Next Conference in March 2018 and were thrilled to have over 500 attendees join us to discuss the secondary impacts of emerging technologies on cities. All of the plenary sessions are available to check out on our website, and you can also link to many of the presentations as well. Last year we focused on how technology is changing cities. This year, we are excited to see how the conversation will evolve as we hone in on the ways that technological changes can be harnessed to achieve desired outcomes. Cities are engaging in innovative pilot projects, and there is a growing emphasis on public-private collaboration. Without a doubt, there is no shortage of topics to discuss since 2018 was a busy year—we saw the growth of Mobility as a Service (MaaS), the meteoric rise of e-scooters, the promises and pitfalls experienced by the AV industry, the continued expansion of e-commerce, and much, much more. We certainly hope you’ll join us in Portland May 7-9 for the 2nd Annual Urbanism Next Conference as we delve into these topics. Conference schedule and registration information will be available soon on our website. Outside of the conference, the Urbanism Next/SCI team has also been working on a number of projects and reports. At the start of the year, SCI Co-Director Marc Schlossberg, along with William Riggs, Adam Millard-Ball, and Elizabeth Shay completed Rethinking Streets in an Era of Driverless Cars. In September, Nico Larco, Amanda Howell, Rebecca Lewis, and Becky Steckler completed the report AVs in the Pacific Northwest: Reducing Greenhouse Gas Emissions in a Time of Automation. We were pleased to be able to collaborate with the cities of Portland, Seattle, and Vancouver, BC on this work, funded by the Carbon Neutral Cities Alliance/Urban Sustainability Directors Network via a grant provided by the Bullitt Foundation. We are currently working on the second phase of this project focused on New Mobility in the Right-of-Way with an emphasis on curb management. Look for that on our resources page later this spring! We have also been hard at work on a National Science Foundation Planning Grant, which enabled us to convene a nationwide network of collaborators from the private, public, and academic sectors to better understand the secondary impacts of emerging technologies on cities. Drawing upon those conversations as well as an expansive literature review, we are drafting a report that builds out the Urbanism Next Framework. That will be finalized later this spring and we will be using it as the basis for an online resource we are developing to help cities, practitioners, and researchers learn about the latest thinking around these topics. Look for the launch later this year! In addition, the team at Urbanism Next has been working on a National Institute for Transportation and Communities project with the Oregon cities of Gresham and Eugene to assess the risks and opportunities for land use, transportation, economic development, and city budget by the deployment of new mobility services including AVs. Our report and findings will be available later this year. We are also incredibly grateful to have had the opportunity to both attend and speak at multiple conferences, meetings, and engagements last year—a particular highlight included Nico’s talk at TEDx CollegePark in June 2018. Look for Program Director Becky Steckler’s TEDx McMinnville talk later this spring! Looking ahead to 2019, we are excited to announce that Urbanism Next will be working with Cityfi on a 5-year project funded by the John S. and James L. Knight Foundation to work with the cities of Detroit, Pittsburgh, Miami, Long Beach, and San Jose to put people at the center of planning AV pilots. We also want to take this opportunity to thank YOU for following and supporting our work here at Urbanism Next. We look forward to continuing to build community with you in 2019. Brown, Anne and Brian Taylor. “Bridging the Gap Between Mobility Haves and Have-Nots.” In Three Revolutions: Steering Automated, Shared, and Electric Vehicles to a Better Future. Daniel Sperling (Ed.). Island Press. Clark, B. & Lewis, R. (2018) Future Transport and City Budgets: Getting Bottom-Line Savvy In An Uncertain Future. In W. Riggs, Disruptive Transport Driverless Cars, Transport Innovation and the Sustainable City of Tomorrow, Routledge. Going to the Annual Meeting of the Transportation Research Board? If so, we’d love to see you there! Here’s what the Urbanism Next team will be presenting on during the meeting and when to find them. Hope to see you in D.C.
12:30 – 4:30PM Workshop, Preparing for Mobility Futures: The Impact of Connected and Automated Vehicle Technology on Transportation Demand Management – Nico Larco will participate in a panel discussion on mobility futures. 8AM – 12PM, Technology Transfer Committee Meeting, An EPIC Way to Move Transit into the Future: TriMet and the University of Oregon’s Sustainable City Year Program – Marc Schlossberg will present on the University of Oregon’s Sustainable City Year Program. 3:45 – 5:30PM, Lectern Session, Changing Landscape and Current Issues of Transportation Revenues – Anne Brown will present on “Voting for Transport: Analyzing Voter Support for Local Option Sales Taxes for Transportation” with Jaimee Lederman, Brian Taylor, and Martin Wachs (UCLA). 10:15 – 12PM, Lectern Session, Sharing and Gender Effects: Trips, Spaces, and Vehicles – Anne Brown will present “Who’s in the Driver’s Seat? Gender and the Division of Car Use in Auto Deficit Households” with Evelyn Blumenberg and Andrew Schouten (UCLA). 10:15 – 12PM, Poster Session, Emerging Research on Social and Economic Factors – Anne Brown will present on “Car-Deficit Households: Determinants and Implications for Household Travel,” also with Evelyn Blumenberg and Andrew Schouten (UCLA). One-click ordering. Free shipping. The ability to have millions of different goods delivered directly to your doorstep within days, or even hours, of ordering—in its quest for growth, Amazon has often seemed willing to go to extreme lengths to get consumers making purchases from the site time and time again. Now, according to a recent article from the Wall Street Journal (paywall), Amazon is starting to tighten its belt and think more about the bottom line. It has started targeting items it has internally designated as CRaP, or “Can’t Realize a Profit.” Items that fall under that category are typically fairly cheap, under $15, but they are heavy, making them more expensive to ship. Beverages are a big one in this category. In order to “fix” the issue, Amazon is working with suppliers to streamline processes, such as having some vendors ship directly from their own warehouses, or changing package amounts. As the Wall Street Journal reports, Amazon used to sell a 6-pack of Smartwater for $6.99 as part of its “Dash” one-click reorder program. However, the company worked with Coca-Cola and changed the Dash default amount to a 24-pack for $37.20 to make it profitable for Amazon. That 6-pack isn’t unavailable—it’s now an item in Amazon’s Prime Pantry whereby consumers can choose multiple items to fill up one box in order to reduce shipping costs. It is interesting that Amazon now seems to want to rectify some of the system inefficiencies it is responsible for creating. Having multiple items ship separately just to get to them to consumers more quickly has never sounded like the most sustainable option, both financially for Amazon, and for the environment. Encouraging consumers to box multiple items together into one shipment instead? Having some suppliers ship directly from their own warehouse as opposed to sending their items to an Amazon facility to be shipped from there? Amazon may be more focused on its bottom line, but these shifts could have important environmental benefits since an optimized system with fewer deliveries equates to fewer trips, which means reduced greenhouse gas emissions. And goodness knows we need that. As Streetsblog noted just today, we absolutely have to reduce driving if we’re going to be able to combat climate change. As cities navigate their way through the new mobility landscape and try to figure out what and how they should be regulating new business and service models, two key roles of government are emerging – one to help create a level playing field for all of these services and two to shape these services to help achieve community goals. A large fear of the shifting models for mobility is that we will end up with a few large, private companies controlling the majority of all of our mobility options. You can imagine a future where Uber, Lyft or Waymo control e-scooter, bikeshare, and ride-sourcing services and we each subscribe to one of their vertically integrated services. One – of the many – large problems with this scenario is that it centralizes control of an absolutely ubiquitous and public need in the hands of a few private entities. Another large concern (and one that could mitigate the first) is that it stifles competition. How would any new mobility concept be able to spread it wings as so many are doing right now if the market is held by a few key players. All innovation would need to happen through these larger companies as gatekeepers and consumers would suffer. The transportation equivalent of current fears about Amazon owning all of our retail options. To combat this, governments can help create level playing fields for new mobility services. As discussed previously on this blog, the key parts of this are supporting (or creating) platforms that allow shared route/cost/time information, offer a uniform payment platform, and allow for multi-company subscription services. (See article on efforts to do some of this in Germany). Large question will be what governments actual role is in this — should they host/build the platforms themselves, establish a shared API (such as LADOT’s Mobility Data Specifications (MDS), for instance) along with open competition regulation and allow others to create platforms, or simply create regulations/guides for the outcomes they want and let the market figure out how best to organize around these (most difficult/dubious, in my opinion). Cities will need to balance controlling the process enough to get to desired outcomes while allowing enough flexibility to attract innovators to participate. The second role governments need to play, once a level playing field is established, is to make sure that playing field has the right shape, incentives and penalties to assure it is supporting the outcomes cities want. Imagine a situation where the open-platform leads to a situation that promotes single occupant car trips and diminishes transit use. Or a situation where this platform leads to certain areas of the city being underserved by services. Cities need to understand what levers exist to shape new mobility services to be equitable, economically supportive of their communities, sustainable, and lead to positive health outcomes. Cities should not be in the business of capriciously or politically favoring one company over another, but they absolutely should be in the business of promoting modes and services that support community goals. In this vein of thinking, Urbanism Next put together a recent report in partnership with the cities of Portland, Seattle and Vancouver that looked at how to regulate AVs (and New Mobility to an extent) with a view towards the cities GHG emission goals. The mobility landscape is definitely in flux and cities need to think through the outcomes they want, and how best to get there. Allowing for competition and supporting services that support community goals are key steps to doing that. Waymo One has arrived. That is what Waymo has named its robotaxi service, which it officially launched in the Phoenix area yesterday. There has been a lot of speculation about what this launch might look like and while it is certainly momentous, it is also fairly limited in scope. The service is currently only available to those who have already been participants in Waymo’s “Early Rider” program. (Apparently, those participants will now be “invited” to pay for their trips in Waymo’s robotaxis.) The big difference is that customers won’t be required to sign nondisclosure agreements, as was required by the Early Rider program, nor will they continually have to provide feedback. Now they can just sit back, relax, and a enjoy a ride in robotaxi anywhere within Waymo’s 100 square mile service area. This is indeed big news—the very first commercial robotaxi service is here. The limited nature of the roll-out, while perhaps disappointing for those are revved up and ready to request a ride in a fully autonomous vehicle, is certainly understandable from a safety standpoint. There have been a few tragic incidents involving self-driving vehicles that have garnered substantial publicity and made many wonder if AVs will really be able to deliver on the promise of making streets safer. (Of course, there is plenty of room for improvement compared to today’s standards.) To that end, Waymo’s robotaxis will continue to be staffed by a Waymo employee ready to take over should intervention be necessary. The ramp up may be slow, but Waymo does intend to make its commercial service more readily available. Last Reminder about Urbanism Next Conference Call for Proposals! Here’s one last, just-in-the-nick-of-time reminder that proposals for the 2nd Annual Urbanism Next Conference are due TODAY (Thursday, Nov. 15)! How can technological innovations be harnessed to achieve desired outcomes? How can the private and public sectors collaborate to ensure that desired outcomes drive technological innovation rather than the other way around? Let us know what you think and what you are working on! Submit your proposal here. Of course, the biggest e-commerce news of the week is that Amazon announced where HQ2 (and HQ3?) will be. They’ve selected Long Island City in Queens, NY and Crystal City in Arlington County, VA and they plan to bring 25,000 jobs to each locale. (They also announced that they would opening an operations center in Nashville, establishing 5,000 jobs.) There have already been a number of interesting think pieces about the announcement, including Citylab, CNN, and Curbed, among others. While the merits of Amazon’s bidding process are up for update and questions abound about whether the tax breaks are too big, one thing does seem certain—e-commerce is reshaping our cities both literally and figuratively. 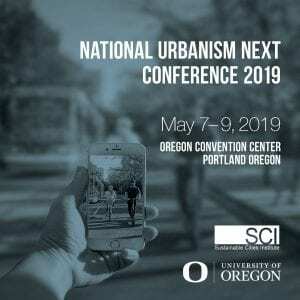 The 2019 Urbanism Next Conference Call for Proposals deadline is coming up fast! Proposals are due by Thursday, Nov. 15 at 11:59pm PST. We are excited to carry the conversation we started in 2018 forward, and we want YOU to help shape the agenda. We invite you to submit a proposal for a session or workshop. Click here for full proposal details and submit your proposal here. For questions, please contact Amanda Howell, Urbanism Next Program Coordinator. On June 22nd, Urbanism Next Center Director, Nico Larco spoke at a TEDx event at the University of Maryland in College Park. The theme of the event was “Get OUTside,” and Nico’s talk was one of many throughout the day that encouraged people to look past their comfort zones, preconceived notions, and existing mindsets to gain a different and better understanding of the world. In discussing the potential secondary impacts of autonomous vehicles on our cities, Nico describes a “second revolution,” one which we may be able to control and influence if we can anticipate the coming technology. The key, he says, is thinking of AVs not as a transportation issue, but as a community issue. The full 15-minute video is now available to watch, and you can also check out Mobility Lab’s coverage of it here! Submit a Proposal for the 2019 Urbanism Next Conference! Mark your calendars! 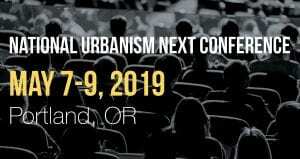 We are pleased to announce that the 2nd Annual Urbanism Next Conference will be held May 7-9, 2019 in Portland, OR. 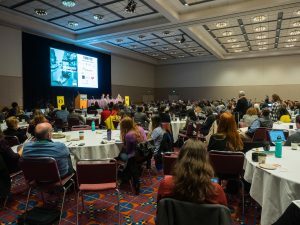 The first annual conference held in March 2018 brought together over 500 planners, architects, landscape architects, developers, technology experts, elected officials, academics, and many others.We’re excited to partner with the National and Oregon Chapters of the American Planning Association, the American Institute of Architects, and the American Society of Landscape Architects, and the Urban Land Institute Northwest. We want YOU to help shape the agenda. We invite you to submit a proposal for a session or workshop. Click here for full proposal details. Proposals are due November 15, 2018 (11:59 pm PST). We look forward to reviewing your proposals and hope to see you in Portland May 7-9, 2019! It seems that there is not a week that goes by that Amazon does not make headlines, and this week is no exception. Yesterday, Amazon announced that it would raise the minimum wage of its U.S employees to $15/hr. The new wage will take effect Nov. 1 and will apply to all of its part-time employees, seasonal workers, and workers hired through temp agencies. This is news to celebrate. 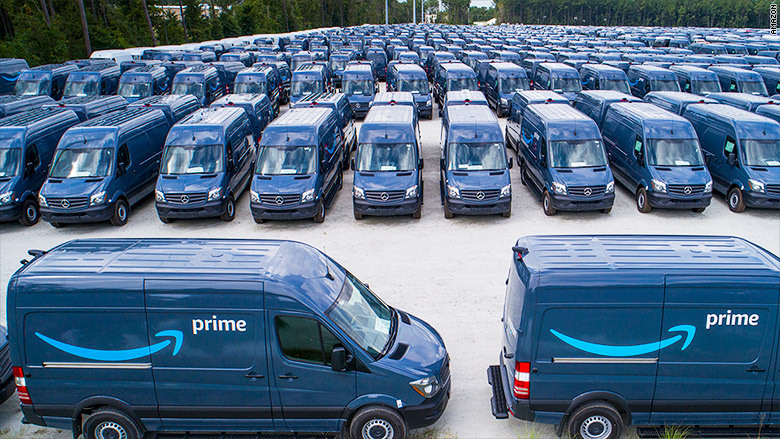 The image of all those Amazon delivery vans lined up and ready to go is a sight to behold. It is interesting, and noteworthy, that cities seem to have trained so much of their focus on the impacts of TNCs like Uber and Lyft on congestion, while the ever-expanding world of goods delivery gets far less notice. While goods delivery certainly replaces some trips that we otherwise might have taken ourselves, Rick Stein recently pointed out that history has shown that we usually don’t just substitute one thing for another. The news about the minimum wage raise is certainly positive, but there are lots of questions that still need to be answered about the widespread impacts that Amazon is having not just on the labor force, but on transportation networks as well. Could a Cap on Ridehailing Curb Equity Gains? Though no longer brand new, ridehail companies like Uber and Lyft continue to cause consternation as cities struggle with how to plan for and regulate them. Some cities have opted for trip-based taxes and fees, while others have regulated the number of cars allowed to operate. In August, New York City became the first American city to cap the number of ridehail vehicles permitted to operate each day . Taxi drivers celebrated this move as a victory against Silicon Valley titans. But some city councilors cautioned that the New York City cap could harm low-income neighborhoods and communities of color, who have historically been underserved or avoided by taxis. Could they be right? My own research on Lyft in Los Angeles suggests: yes. Ridehailing extends reliable car access to low-income neighborhoods, majority-black neighborhoods, and areas with limited access to personal cars. A cap on ridehailing could concentrate drivers in wealthier neighborhoods, driving up prices and wait times in lower-income neighborhoods. In other words, a ridehail cap threatens to undermine the access it delivers to neighborhoods that need it the most. Lyft serves everywhere. Data from over 6.3 million Lyft trips in Los Angeles reveal that Lyft service is remarkably ubiquitous. In a county with dense urban centers, sprawling suburbs, and remote mountain towns, Lyft trips served neighborhoods home to 99.8 percent of the population. Lyft is used most where personal car access is lowest. Most people used Lyft to fill an occasional travel need, taking just one trip per month on average. 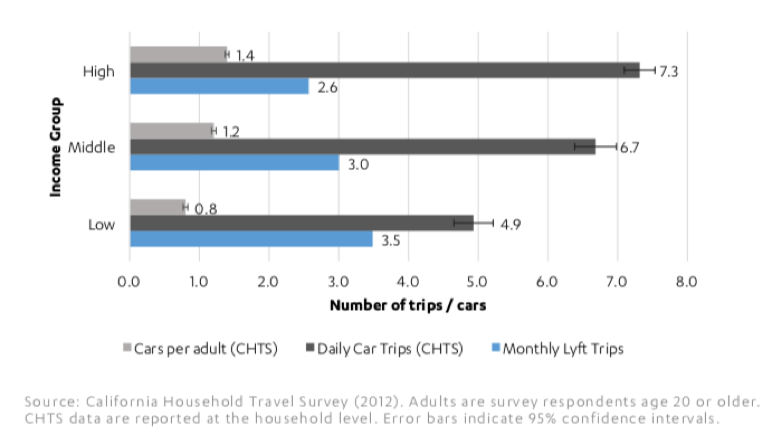 But data also suggest that people took more Lyft trips where its close substitute—the household car—was scarcest and corresponding car travel was most limited. Ridehail use is highest in low-income neighborhoods. Riders living in low-income neighborhoods relied disproportionately on Lyft, taking 36 percent more Lyft trips per month than users living in high-income neighborhoods. Riders in these neighborhoods made more of their trips on shared and less-expensive Lyft Line compared to riders living in high-income neighborhoods. Over one-third (34%) of users in low-income areas made shared trips on Lyft Line while users in high-income areas used this service less frequently, approximately 22 percent of the time. These results suggest that sharing provides an important low-cost option for cost-sensitive travelers. Access is improved, yet questions remain, in communities of color. Taxis have historically avoided or refused to serve communities of color. Lyft presents a more promising story. Riders living in majority-black neighborhoods in Los Angeles took more Lyft trips than riders living in neighborhoods with any other racial/ethnic majority group, even after accounting for neighborhood characteristics like density and transit service. At the same time, questions about barriers to ridehail service remain. Riders living in majority-Hispanic and majority-Asian neighborhoods took fewer trips than expected all else being equal; lower use in these neighborhoods may reflect unequal banking access, smartphone ownership, or other barriers that inhibit residents from hailing a Lyft. More research is needed to ensure that all travelers can hail a ride. Ridehailing provides car access in neighborhoods where personal access to cars is lowest. Capping the number of ridehail vehicles could encourage drivers to concentrate on higher-income neighborhoods, where they may anticipate more demand and longer, pricier trips. Taxis have long ascribed to this model, gathering around downtown hotels and businesses where they anticipate high-paying clientele. In doing so, taxis often avoid lower-income neighborhoods where personal car access is lowest, despite data showing that the residents in these areas rely disproportionately on taxis to travel by car. A ridehail cap could similarly encourage drivers to flock to wealthier neighborhoods, raising prices or wait times in less-affluent or less-central neighborhoods. Higher prices and long wait times in these communities could undermine the access benefits that ridehailing has provided to date. Worse, attempts to draw drivers into these areas through tactics such as “surge pricing”, while an incentive for drivers, could put ridehailing out of financial reach entirely for those who need it the most. Instead of simply capping ridehailing, cities should consider the holistic role ridehailing can play in the broader mobility puzzle and how different regulations will affect cities’ visions for the future. While ridehailing can and should be regulated—such as to maintain safety standards or require data sharing—it is important that cities understand the wider effects of these regulations and implement equitable policies that will improve access for all. The largest grocery chain in the U.S. recently announced they are testing driverless grocery delivery in Scottsdale, Arizona. In the U.S., The Kroger Company is the Walmart/Amazon of the grocery sector. In other words, this is a big deal. We’ve spent a lot of time discussing the impacts of AV on the transport of humans, but the earliest, and arguably the most profound impacts, will occur because of rapidly changing consumer expectations. Kroger’s pilot program currently uses an autonomous Prius with a human in the driver’s seat to monitor the car’s performance, but future versions of this service will be completely autonomous. Kroger is partnering with Nuro, a startup founded by two Google engineers who worked at Google’s Waymo venture. During this pilot phase, a clerk loads the groceries into the vehicle and then the vehicle delivers the groceries to the customer at their curb where the customer enters a numeric code to open the vehicle. These are baby steps towards the inevitable – the complete automation of the entire process from ordering to stocking the food pantry in your home. And oh, by the way, the entire supply chain will be automated as well. It’s time to make friends with our robot overlords. This past March, I and two of my colleagues traveled to Portland for the inaugural Urbanism Next Conference where we gave a presentation in which we speculated that the retail industry will likely be the earliest, and most significant adopters of autonomous vehicle technology. The presentation was well-received and even got some love from the folks at The Atlantic’s CityLab. At the time, we told those in attendance to prepare for the one-hour delivery of virtually anything within three years or so. A series of recent acquisitions and partnerships undertaken by The Kroger Company seems to validate the ambitious goals of automating the entire grocery procurement process. While the timeline for achieving these goals will be impacted by factors such as regulations (including zoning), technology, safety, and the economy, to name a few – make no mistake, it’s coming. Up until now, all you really needed to do was pay attention to the seemingly daily barrage of articles about Amazon and Walmart competing for the consumer’s attention. Now we can throw Kroger into the mix as well. Obviously, there will be other retailers that embrace autonomy in the next couple of years – many, many others. The battle to bring goods to the market for the lowest price has long been the goal of the largest retailers, but prices can only go so low before producing a good stops making sense. The war on price isn’t over, but it is going to take a back seat to the next epic fight – the battle over your time. And this war will be ugly if we aren’t prepared for it. 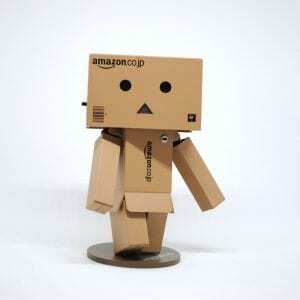 In 2005, Amazon introduced us to Amazon Prime – a membership-based service that promised free two-day shipping on eligible purchases within the contiguous United States. Within a few years, we will likely reflect on Amazon Prime as a cute idea. From this point forward, the consumer’s “time” is squarely the target of the world’s largest retailers. While a lot of attention is paid to the concept of “experiential retail” as a means of saving conventional brick and mortar retail, the battle over our time will have a much larger impact on us all, regardless of our level of consumerism. Amazon is currently rolling out a two-hour delivery service from Whole Foods through Prime Now. Prime Now does not use autonomy/robotics/AI and it is only for items stocked at Whole Foods. Rest assured, future versions of Prime Now will almost certainly employ all those inter-related technologies and will extend way beyond grocery items. Each of the major retailers will try to one-up each other to deliver goods to us as fast as is technologically possible. What does this mean for our cities? Well, it means cities need to be prepared for a level of disruption not seen since the widespread adoption of the automobile and the post-World War II demand for housing produced the modern suburb. There are going to be autonomous delivery vehicles on our roads – a lot of them. You could make the argument that if I purchase goods online and the goods are delivered to me (autonomously or not), then aren’t I simply substituting my trip with another’s trip? In theory this is true, but we have evidence in the form of humankind’s relatively recent adoption of computing technology, that we don’t merely substitute one thing for another; rather, we tend to add additional tasks into the voids created by technologically-enabled efficiency. For example, the adoption of electronic spreadsheets reduced the amount of time to complete most accounting tasks. Calculations that took hours or days to complete could now be done in a matter of minutes or seconds. Employers took advantage of that time savings and added more and more tasks. Smart phone adoption is a more recent example of a tool that made us more efficient on one hand, but somehow resulted in us being even more busy than before. It stands to reason that if we chose to have most things delivered to us, we will use our newfound time to do something else – and that something else may very well be taking a trip somewhere – perhaps a trip to an experiential retailer. How are we going to deal with all these extra vehicles on our streets and roads? We don’t have the space or the money to build our way out of it. Not to mention, there is no evidence that it is even possible to build your way out of traffic congestion in the long run. Further, we haven’t even talked about the inevitability of existing physical retail buildings functioning as distribution nodes and the challenges this presents to existing zoning. That is another conversation for another blog post (or book). The takeaway is this – our cities are ill-prepared to handle the disruption that is coming their way. The “solutions” are going to be complicated and will impact everything from zoning to transportation funding. Although cities are on the front lines, this will require an “all hands on deck” approach that includes regional, state, and federal coordination. The way we manage autonomous delivery of retail goods will likely be an indicator of our ability to manage the autonomous delivery of humans. It’s the proverbial canary in the coalmine. 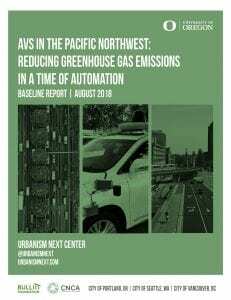 Urbanism Next is pleased to share a new report: AVs in the Pacific Northwest: Reducing Greenhouse Gas Emissions in a Time of Automation (Larco, Howell, Lewis, and Steckler). The policy decisions made over the next 10 years that shape the deployment of autonomous vehicles (AVs) will have significant repercussions for our communities as well as environmental repercussions related to greenhouse gas emissions and adaptation to climate change. In recognition of that, Urbanism Next worked with the cities of Portland, Seattle, and Vancouver, BC to better understand how new mobility technologies such as AVs could affect greenhouse gas emissions thereby impacting their ability to achieve the goals in their respective climate action plans. After conducting a literature review, reviewing existing new mobility documents, conversations with stakeholders, and conversations with partners in the public, private, and academic sectors, we compiled a variety of possible implementation actions that we think cities could consider to reduce GHG emissions. We invite you flip through and see what you think. (Please note, while we we think the actions we identified can serve as a starting point for thinking about the impacts of AVs on climate goals and how best to mitigate the potentially negative ones, we know that this will be an ongoing, iterative process as promising practices are developed.) There may be challenges ahead, there are also many opportunities to make positive changes. We hope those opportunities will seized! This project grew out of a partnership between the Carbon Neutral Cities Alliance at the Urban Sustainability Directors Network (CNCA/USDN) and the Cities of Portland, Seattle, and Vancouver and was generously supported by the Bullitt Foundation. Cities are starting to see a vertical integration of the Mobility as a Service (MaaS) landscape. A number of companies (see examples of Uber and Lyft) are realizing the opportunity to provide multiple MaaS options to their clients and not only focus on one part of the mobility pie. Rideshare, bikeshare, e-scooters, etc. all have the possibility of on one hand cannibalizing one another and on the other being an entryway to a broader set of possible MaaS options. By integrating services vertically, companies can offer a broader suite of services and ensure that all transactions are within their platform (and their bottom line). While vertically integrated MaaS options will have large benefits for users, it also points to a potential future where a few dominant companies offer a Helsinki-like vertically integrated mobility option. As a consumer you may end up needing to decide if you want to subscribe to the Lyft MaaS suite, the Uber MaaS suite, or the Waymo MaaS suite. A large concern with this is that it will stifle competition and keep small companies out of the marketplace. Cities can play a lead role in ensuring that this doesn’t happen so that their residents have a wider range of options and the economic benefits of MaaS are not restricted to a few large, key players. Shared route/cost/time information– There are already a number of examples of this happening thanks, in large part to Google’s leadership on creating GTFS. A number of apps – including Google’s own Google Maps – let you compare travel options, complete with time and cost information. The next generation of these apps needs to start thinking about how to show expanded travel options which mix modes (the height of the MaaS vision). It would be great to see a travel option that includes bikeshare from your house to the transit stop, the transit trip itself, and then a scooter option for the last-mile. More and more, this is exactly the types of trips we will all be making in a MaaS world. Uniform payment platform– Critical in making all of this work is a single payment platform that allows easy movement from one mode and service to another. This will facilitate use of the most efficient mode of travel and will allow small companies to compete with larger ones. While uniform payment has been a challenge in many parts of the US, there are examples abroad that show this is absolutely possible. For example, OV Chipcard in the Netherlands is a single payment platform that is used by train, tram, bus, carshare and bikeshare companies. It is simple to plug into the system and from the user’s perspective, makes transportation choices easy to make. Multi-company subscription services – Both of the points above create the opportunity for multi–company subscription services where movement between MaaS modes becomes easy and economically beneficial. The difficulty will be in finding the framing and levers to bring private sector companies along and not have them each create their own transportation fiefdoms. One large lever will be that, if this shared subscription marketplace can be created, companies will want to join simply to have access to users. If they are outside of it, their competitors will get the rides. It is a tricky proposition and will require a good amount of thinking and coordination (both with companies and with regulatory bodies) to make this work, but the potential upside is tremendous for user experience, economic opportunity, and for the overall efficient use of the transportation network. This is an important moment where cities should be shifting their thinking from how to deal with a continuing series of mode innovations (e.g. e-scooters being the latest one) to a more expansive and forward thinking approach that is focused on outcomes and on creating a broad platform that can accommodate current and future transportation options in a level playing field. Curious about the impacts of emerging technologies on things like parking revenue, traffic fines, registration fines, and other transportation revenue streams? Well, the Transportation Research Board is organizing a webinar about these very questions on Thursday, September 6 from 1-2:30PM ET! This webinar is based on a workshop that was presented in January at the 2018 Annual Meeting of the Transportation Research Board and will feature Urbanism Next Center Director Nico Larco. Bruce Schaller, who recently published a report on “The New Automobility” that has garnered a fair bit of attention, will also be presenting. (See here and here for some interesting responses to his findings.) Additional details about the webinar can be accessed here. If you’re interested in learning more about the impact of emerging technologies on municipal finance, check out the Urbanism Next white paper on this topic that was published last year! It is official—after much anticipation, the New York City Council voted to impose a year-long cap on for-hire vehicles and will not issue any new vehicle licenses for the duration of the cap period, although they have made an exception for wheelchair accessible vehicles. (Of which there are not nearly enough.) During the upcoming year, the New York Taxi and Limousine Commission (TLC) will also be tasked with studying whether to adopt vehicle utilization standards or regulations…essentially, they will determine if there should be permanent regulations in place limiting the number of for-hire vehicle licenses issued, much the way that taxi medallions have been regulated for decades. Perhaps unsurprisingly, Uber and Lyft lobbied pretty hard against this bill, arguing that a cap on the number of vehicles will decrease vehicle availability leading to longer wait times and, possibly, higher fares. Despite their efforts, the bill passed 39-6. According to the NY Times, the number of for-hire vehicles in the city has increased to 100,000, up from 63,000 in 2015 when Mayor de Blasio tried, and failed, to institute a cap. This time around, there was support not just from taxi drivers who have seen the value of their medallions plummet but also many of the independent contractors who drive for the TNCs. (The Independent Drivers Guild was heavily involved in the campaign to pass the bill.) In addition to imposing a cap on vehicles, the NYC Council also voted in favor of giving the Taxi and Limousine Commission the ability to establish minimum payments for for-hire drivers—a big win for drivers. For a window into the for-hire driver’s view, I suggest checking out the Independent Drivers Guild’s FAQs about the cap, which provides a easy-to-digest summary of what they’re anticipating the cap will mean. (They anticipate the demand for leasing to skyrocket under the cap as new drivers look for ways to acquire vehicles.) The Rideshare Guy, a go-to source of information for rideshare drivers, also posted a summary of the suite of bills that passed yesterday and how to decipher them. It will be illuminating to see how the vehicle cap plays out in NYC over the coming year, and what findings the TLC arrive at. But one thing does seem clear…there may be enough political support to cap TNCs in NY but the private vehicle will live to see other another day without a congestion fee or a cap. Urbanism Next is growing! We are hiring a Project Manager to oversee a variety of research projects, as well as to develop the Urbanism Next Clearinghouse, a national online resource. If you’re interested in emerging technologies and the impacts that they are having on how we live, move, and spend our time, then this may be the job for you! These are exciting, challenging, constantly-evolving issues and there’s lots of work to do be done. We hope you’ll consider joining the team. For a full description of the position, check out the job posting here. The first review of applications will take place August 21, but the position will remain open until filled. What Could Off-Road AV Technology Mean for Urban Street Design? Land Rover has just announced Cortex, their investment in off-road AV technology, and Wired summarized the project in a recent article. Outdoors enthusiasts have expressed skepticism in people’s willingness to give up conventional vehicles since it would mean losing the ability to adventure in places that are only accessible by rough, unpredictable roads. So far, experts hypothesize that AV technology will need a highly controlled road space with smooth surfaces and freshly painted markings, but this clearly poses challenges to adoption since many roads, even in cities, don’t fit these criteria. While AVs capable of all-terrain navigation are obviously useful for reaching a favorite mountain hike, they could also provide additional benefits in more developed areas. For example, shared streets could become easier to implement since clearly designated lane markings wouldn’t be needed to keep the vehicles on track. Cities could change up the street space by adding planters or street furniture without requiring navigational software updates for all the cars in town. Plus, cities could save a lot of money if roads don’t need to be maintained in pristine conditions all the time. There is one last benefit to more adventure-ready AVs. If people no longer need to hold on to their conventional cars for their outdoor adventures, the transition to a fully automated vehicle stock could happen sooner, meaning cities will exist in the confusing transition period for less time. E-scooters will be capped at 2,500 TOTAL throughout the pilot period. Every company holding a permit to deploy scooters will be required to deploy a minimum of 100 scooters or 20% of its local fleet in historically underserved East Portland neighborhoods as defined by the City’s 2035 Comprehensive Plan. In addition to requiring safety and complaint histories, the application process also requires companies to submit a user equity plan and an economic opportunity plan. Companies must adhere to a data sharing agreement. AND there will be $0.25 per-trip surcharge assessed by the City. Yes, you read that right. The City of Portland is assessing a per-trip surcharge, and according to Sightline Institute’s Michael Andersen that’s just fine. Andersen argues that over-regulating scooters (like capping the number of scooters) is a bigger risk than overtaxing them. This is a thorough and interesting piece…definitely recommended reading. While only time will tell how this all plays out, this permitting process appears to holds promise, especially if the equity components are realized. Our transportation options are expanding tremendously. Innovations in new mobility ranging from dockless bikeshare, to dockless e-scooters, to hoverboards, to terrestrial drones, to microtransit, are bringing a wide range of new players into the streetscape. All of these modes are going to need to integrate with existing pedestrians, cyclists, transit, freight vehicles, and – of course – the automobile. The question is where each mode should live and what areas of the street should be open to each mode. Historically, we have divided the street by mode: pedestrians on the sidewalk, bikes in the bike lane, cars/freight/transit in the vehicle travel lanes. A few mixes have been allowed (bikes on sidewalks or in vehicle travel lanes for instance). The proliferation of mobility options is forcing us to reconsider how we organize the street. And given the speed at which new options keep arising, reorganizing the street each time a new option arrives, or creating designated lanes for each mode is becoming unfeasible. What if, instead, we reframed our current thinking of streets to go from a separation by modes, to a separation by speed. Our sidewalks can continue to be defined by the speed of pedestrians. Into that can now also be introduced terrestrial drones and low speed hover boards. The former bikelane can now become a zone for anything moving up to 15 mph. E-scooters, faster moving hoverboards, low speed delivery vehicles, low speed AV microtransit shuttles could all exist in this area. Further into the street we could have a zone of 15-35mph that accommodates legacy cars, AVs, transit and freight. 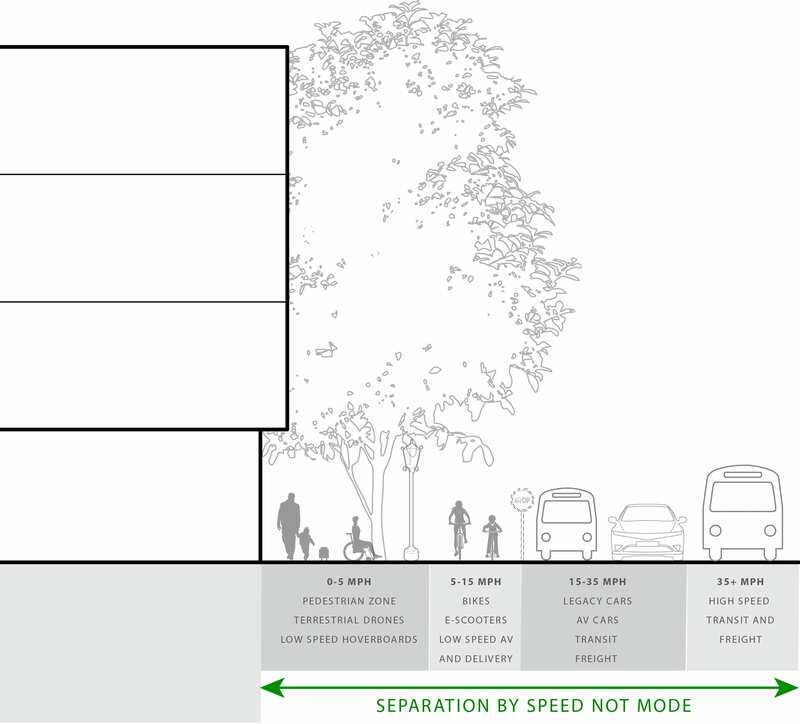 And finally, we could potentially have a zone (on some streets) that accommodates the highest speed vehicles – and with connected vehicle technology could act as a dedicated (or at least prioritized) lane for high occupancy and high speed transit and freight. Reframing the street this ways can give heightened status to a range of lower speed mobility options and increase the real-estate for these modes on the street. It can create more efficient street flow in much the same way a boulevard does as it separates travel by speed. It also provides a model that easily accommodates new mobility modes as they arrive. As mobility changes, our streets will need to change as well – a great opportunity to improve the experience for all users and to re-balance the space currently given over to the automobile. New, better options exist. We need to make street that work for them. The e-scooter business just keeps heating up, it would seem. The most recent news, announced this morning, is that Uber is investing in Lime as part of a $335 million financing round for the bikeshare and e-scooter company. GV (Alphabet Inc.’s venture capital arm) is leading the deal and values Lime at $1.1 billion. 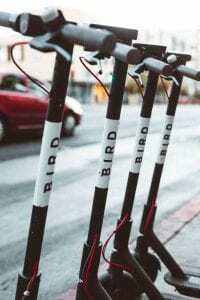 (FYI, Lime’s rival Bird Rides is apparently valued at $2 billion.) As part of the partnership between Uber and Lime, Uber will be making e-scooter rentals available through its app. That means the company that started as a ride hail service now offers customers access to bikes as a result of its recent acquisition of Jump, as well as soon-to-come e-scooters. (Uber isn’t the only one expanding its offerings—Lyft is purchasing the bikeshare company Motivate, which operates the Citi Bike program in New York in addition to other bikeshare programs.) One of the reasons that Uber cited for being interested in Lime is because the company already has scooters available in several major cities. However, Uber has apparently also filed an application in San Francisco to introduce its own scooter service. It will certainly be interesting to see how that unfolds but suffice it to say, the wave of e-scooters is building speed rapidly…and likely coming to a city near you. For some cities, using Uber is cheaper than driving. This is the future of TNCs and AVs. This is the finding from Mary Meeker’s (of Kleiner Perkins) internet trend 2018 report. 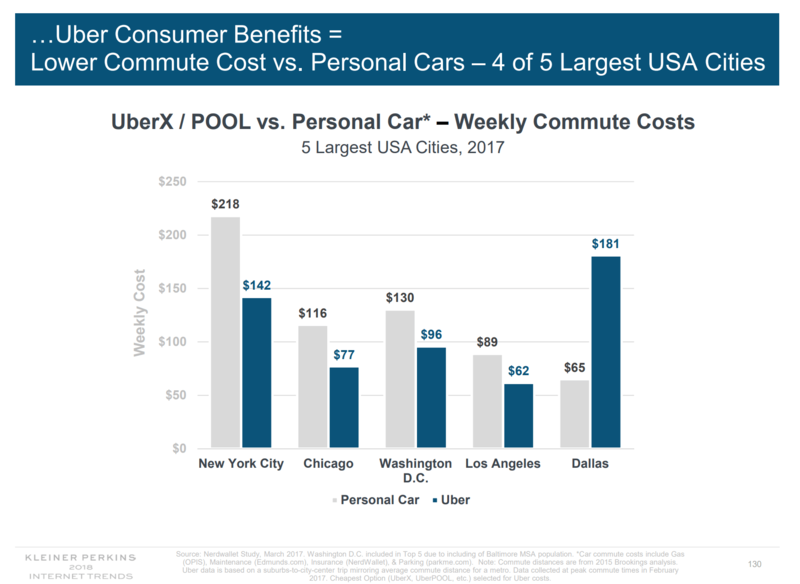 She notes that there is 2x year over year growth in rideshare rides, with 20% of those rides being taken using shared rides (UberPool)—in markets where that service is available. She also notes that public transit use is up 30% since 1995—though use has been flat or declining in more recent years. One of the more interesting things in the report, to me at least, is that the cost of operating and maintaining vehicles has increased as a share of personal spending over the last 45 years. The complexity of vehicles has increased. Based on what we know about AVs’ complexity, it would seem as though their complexity will be substantially higher, perhaps pushing toward fleet ownership, where economies of scale could make that cost of ownership lower if you’ve got a lot of cars rather than just the one. 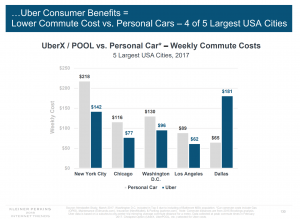 Clearly, this is speculation, but with evidence that people are increasing their use of TNCs, becoming more willing to share their rides, and that in some cities TNCs are already cheaper than car ownership, then it becomes safer to assume that the AV world and the world of shared-mobility will collide sooner than many expect. One focus of the work of Urbanism Next has been to try to understand and organize the various impacts of emerging technology on cities. We have done this through conducting and gathering specific research, developing and disseminating reports, through our conference and through the building of a national network of partners in the public, private and academic sectors. Through this work, we have developed a long list of impacts we should all be considering when looking at the effects of new mobility, e-commerce and the sharing economy will have on cities. While this was a helpful first step, we saw a strong need to organize these impacts in a way that makes them easy for us to understand and relate to each other. What we are presenting here today is a draft of what we are calling the Urbanism Next Framework. 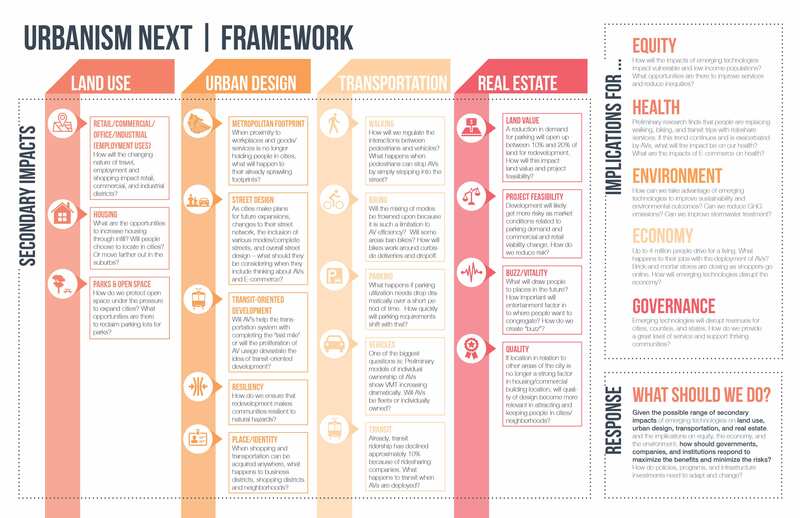 This framework organizes impacts based on four key areas – land use, urban design, transportation, and real estate – and relates those to the implications they will have on equity, health, the environment, the economy, and governance. This framework is helping guide our research efforts, helping us understand gaps in knowledge, and helping us make links between the various areas impacted by emerging technology. We are currently engaged in various projects, including work with NSF and the Bullitt Foundation, that is based on this framework and we will be sharing the outcomes of this work – that deepens the information in the framework further – shortly. As mentioned, this is a draft document, so we look forward to hearing your comments and thoughts about how this resonates with you and about how it might be modified and improved. We hope this framework can help organize both city responses and research about emerging technology impacts and can help all of us push ahead in these important tasks. We already know that transportation network companies (TNCs) are shaping our mobility choices and behavior in all kinds of ways…perhaps you’ve read about how people are increasingly substituting pricey ambulance rides with TNCs…which got us thinking about the myriad ways that medical institutions are already being impacted by emerging technologies and how the advent of autonomous vehicles (AVs) might further impact them. How does a medical institution, a transportation microcosm of both people and goods movement, plan for the future in the face of disruptive technologies? That’s the question that a recent ‘Future Proofing’ workshop for staff at the University of California, San Francisco (UCSF), a premier medical, teaching, and research institution, attempted to address. Urbanism Next’s Becky Steckler partnered with the transportation planning and engineering firm Fehr & Peers on the workshop to assess the implications of current transportation trends on UCSF in 2035 assuming a reasonable range of AV fleet adoption, and to identify the most problematic potential effects/outcomes UCSF wants to avoid. 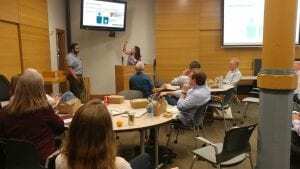 The workshop sought to educate UCSF staff on the current state of emerging technologies, including TNCs, AVs, and autonomous delivery technologies, and provide them with an opportunity to rank potential implications as well as identify gaps. The primary focus of the workshop was the impact that these disruptive mobility trends will have on the practices at UCSF. (It is worth noting Fehr & Peers has developed a nifty tool that approximates the relative magnitude of the effect of these trends on vehicle trips, parking demand and curbspace demand, based on different AV adoption scenarios. Check out a snapshot below of the results for one of the scenarios that UCSF tested and/or learn more about the effects of autonomous vehicles on their webpage here). As you can imagine, these are all BIG issues and we’re all still trying to figure out what the solutions should be. However, it is important to acknowledge and commend UCSF for recognizing the need to “future proof.” If we’re planning cities, or even our hospitals, for the ways thing look today then we are already behind. 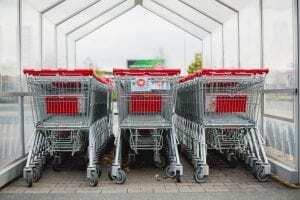 By the end of 2018, you may have groceries at your doorstep without a driver. 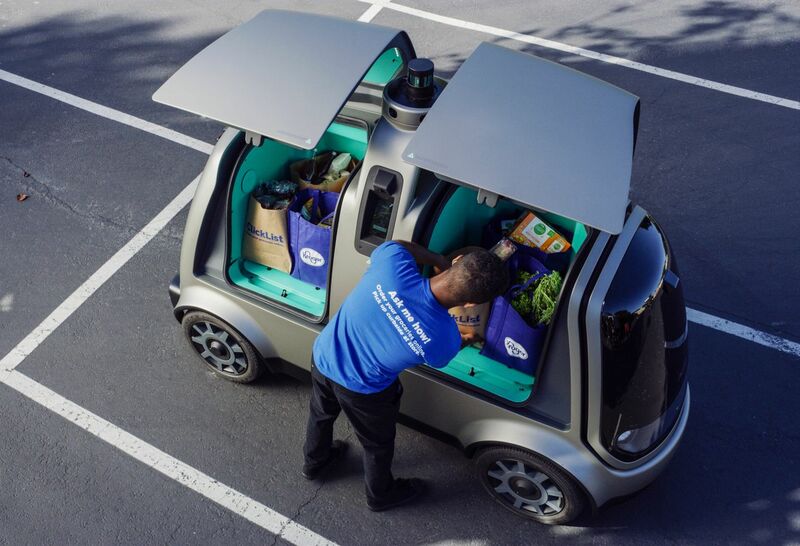 Kroger is working with Nuro, a company started by former Waymo employees, to develop a self-driving delivery vehicle for groceries. Kroger already delivers groceries in many markets it serves, so this would a service that would allow the company to no longer send out drivers. This may be evidence of some of the first jobs lost due to AVs, but depending on the demand for this service it could be just the start of adding more jobs (people selecting and bagging the groceries for the AV delivery). While the second model, being worked on by Robomart, in development is a mobile grocery store. Robomart would bring the store to you. 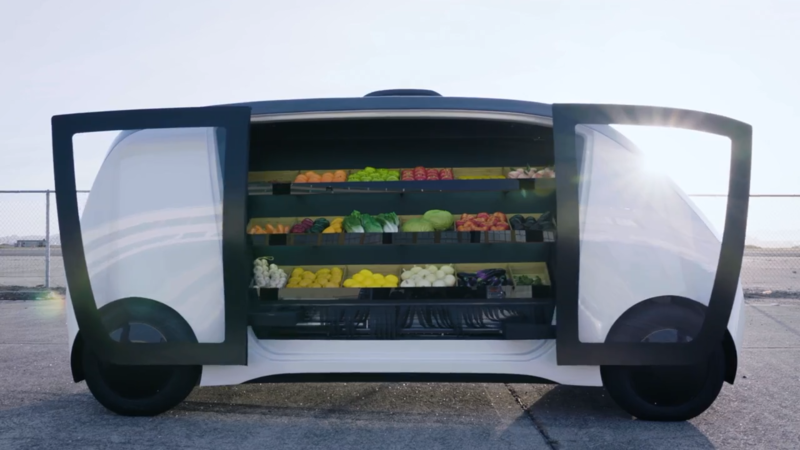 Based on the public images of the vehicle in development, this vehicle would primarily stock fresh fruit and vegetables. They are counting on people’s hesitation to allow others to select fresh fruits and vegetables. Like the Domino’s Pizza AV delivery pilot project, these uses of AVs are likely to be coming soon to all types of goods and services that currently have brick and mortar presence in our lives. State and Local budget officers around the country released a collective sigh of relief this week as the Supreme Court ruled in their South Dakota v. Wayfair ruling that online retailers can be forced to collect sales tax. In a ruling from 1992, known as the Quill ruling, the Supreme Court had previously ruled that retailers without a physical presence in a state didn’t have to collect sales tax for catalog orders. The thought for many at that time had been that sales tax collection was too complicated for small catalog (and eventually online) retailers to charge the correct rates and remit payment accurately. As Supreme Court Justice Kennedy noted in his majority opinion, “States may not impose undue burdens on interstate commerce.” In the past, the collection of sales tax was seen as an undue burden on interstate commerce, but with the advent of technology and spread of online retail, this challenge became less and less of a burden. As the Tax Policy Center points out, this “new” ability of states and local governments to collect taxes is not a new tax at all, but rather this tax revenue is “a tax that most consumers already owe.” (You are typically asked how much you purchase online when you file your income tax return and asked to pay for uncollected sales tax–though most people ignore this request.) As we have previously written about here on the Urbanism Next blog, the amount of tax that has gone uncollected because of the previous Quill ruling, some estimate this to be as high as $34 BILLION annually (for the whole US). In the Wayfair ruling Justice Kennedy was right to note that “Quill creates rather than resolves market distortions. In effect, it is a judicially created tax shelter for businesses that limit their physical presence in a State but sell their goods and services to the State’s consumers, something that has become easier and more prevalent as technology has advanced.” Online retail was/is creating market distortions, as any local retail could have told you for the last 15 years or so. And finally, Kennedy notes that the US government could no longer rely upon an “anachronistic rule that deprives States of vast revenues from major businesses.” This realization that online retail is just retail will help fill holes in state and local budgets that have been growing and growing. The Quill ruling was, for some online retailers, creating an incentive to not invest in brick-and-mortar retail because they didn’t want to comply with the sales tax provisions. With the Wayfair ruling now the law of the land, there may be some real positive outcomes for establishing some physical storefronts online retailers that they had been hesitant to do. Naturally, states that have taken advantage of the no sales tax business are not particularly happy about the ruling. New Hampshire is home to Wayfair and other online retailers has seen its political leaders calling the Wayfair ruling ‘disastrous.’ Perhaps for them, but not for the rest of the country. This decision creates mountains of red tape for small businesses in NH and across the country, hurting their ability to grow and create jobs by selling on the internet. However, the Wayfair ruling doesn’t resolve all sales tax questions. The Tax Policy Center notes that “While the Court gave states broad leeway to collect sales taxes, it left many questions unanswered. For instance, should tax be collected based on the location of the seller or the buyer? If the latter, should it be based on a billing address or a shipping address? Should small firms be exempt from the requirement to collect tax? If so, how should small be defined?” This means that Congress can and should act soon to clarify these questions so that states and local governments can begin to plan more appropriately for their future. Until Congress acts, the states have the authority to enforce and collect sales taxes as they see fit. For the most part, states have indicated that they will only collect sales taxes for future sales, but that doesn’t mean a state could look backward and collect on sales from prior years. Given that most online retailers didn’t collect the sales tax, they may be liable for paying them nonetheless, which could pose a hardship on those retailers. This backward question seems like one that would be politically hard to justify for many states and local governments, but only time will tell how tenaciously it is enforced. At the beginning of May the mobility company LimeBike announced it was shedding the word “bike” from its name. In their announcement, the company described its pivot as “a subtle shift that means big things for the world of smart personal mobility.” Along with revealing its name change, Lime also announced the release of its Lime-S electric scooter, powered by Segway. Lime, which started in 2017 with dockless bikes and e-assist bikes, officially entered the e-scooter game along with the likes of Bird, Skip, Spin, and Goat. (Apparently a four-letter name is popular in the world of new mobility…Uber, Lyft…perhaps another reason for Lime to drop the onerous additional four letters?) Lime seems to have meant what it said that its name change could mean big things for the world of personal mobility. Just last week Axios published a scoop on Lime noting that the company intends to expand its business to ultra-compact cars and hopes to begin offering customers the opportunity to rent an ultra-compact car, like the Renault Twizy, as early as Q4 this year. And what about those e-scooters? According to the scoop, Lime deployed its e-scooters with just three weeks of prep work (much to the chagrin of many San Franciscans…) and broke even in just two weeks. TWO WEEKS. That’s a pretty quick turnaround. Furthermore, Lime estimates that by the end of the year the e-scooters will have a gross margin of $12.40 and a payoff period of just one month. 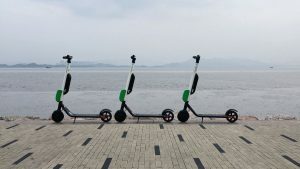 What that means is that the heat is likely about to turn up as Lime, and its competitors, race to deploy the e-scooters in as many as cities as possible. As always, questions about who benefits remain. Even though the costs of entry to the charging game are relatively low, you still have to have an address and a bank account in order to register. (You may also need to have access to a vehicle, according to Lime’s site.) And in order to ride one, you have to have a driver’s license and a card you can connect to your account. How can we ensure that the personal mobility revolution serves everyone and not just those who are more likely to be well-served already? Urbanism Next On the Road This Week! On Friday, June 22 Nico will be heading to Capitol Hill for a congressional briefing on the “Secondary Impacts of Autonomous Vehicles” hosted by Rep. Blumenauer. The lunchtime briefing will be held at 2167 Rayburn House Office Building from 12-1pm. The briefing will be open to the public, so please feel free to attend if you’re in the D.C. area on Friday! Urbanism Next Conference Videos and Presentations Now Online! Join us in Portland on June 1! Nico Larco, Urbanism Next Lead, will be speaking at the University of Oregon’s Wings event on Friday, June 1 along with three other UO-affiliated presenters. Wings: UO Presidential Speakers Series is a curated series of talks showcasing research, innovation, and creativity. If you are interested in hearing more about the more research we’re doing at Urbanism Next, as well as checking out the interesting work that the three other presenters are doing, we hope you’ll join us on Friday, June 1 at 5:30pm! More information about the event is available at UO Speaker Series and tickets are available here. A recent article from Curbed examines our long-neglected pedestrian infrastructure and the variety of solutions that are being tested to improve our most basic form of mobility – walking. Sara Polsky writes about the benefits of pedestrian-centered streets as well as some of the reasons people were relegated to the sidewalk in the first place (hint: it was because of cars). 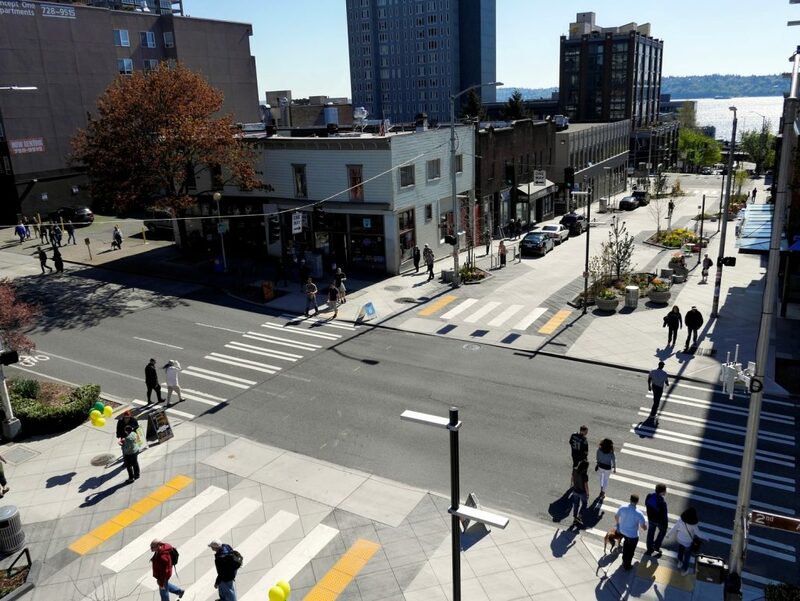 Seattle is testing temporary, permeable pavement that can be removed as street trees grow, with the pilot streets serving as pedestrian-oriented spaces. Some American cities are starting to consider the Dutch idea of woonerf, or “shared street,” where all modes of transportation intermix with each other. This idea has already started to spread across Europe. Design and tech companies are promoting a variety of design ideas of multi-modal streets or reclaiming parking spaces for other uses including parklets, bike corrals, or café seating. The big names include Pensa, Nelson\Nygaard, and Perkins + Will. Even Zipcar, Uber, and Lyft have partnered with other mobility tech companies to create a collective vision for transportation. Google-incubated Alphabet spinoff is busy building Sidewalk Toronto, a $50 million, 800-acre neighborhood-from-scratch in the Quayside district of Toronto. The neighborhood will exemplify the idea of walkability and mixed-use development. With the advent of autonomous vehicles, some of these ideas could become even easier to implement. With the expected reduction in parking need and narrower vehicle lanes, more space could be converted from car-only to multi-modal. The Curbed article discusses these ideas as well, and brings up the idea that with ubiquitous sensors, AVs could even operate in a shared street environment. Maybe new street design ideas should start thinking outside the sidewalk box.